London KUTTu is also called PUri MaSAl in hotels. Boil the potato, cool and peel the skin. Mash it gently to have visible pieces of potato. Cut onion, green chilli and ginger into small pieces. Take oil in a kaDAi and heat. Add black gram and then mustard to splutter. To this add the pre-cut onion, green chilli and ginger pieces. Sauté well for 5 minutes. Add water, turmeric powder and aniseeds. Boil these for about 5 minutes. After the onion becomes tender, add the mashed potato and salt. Allow boiling for 5 minutes. When it becomes a sort of gravy remove from fire and garnish with the chopped coriander leaves. Serve hot. Goes well with pUri, chapatti and paRAtta. Those who wish to have it more spicy, can add a little of garlic, garam maSAlA powder and sugar. Lemon juice can also be added if a little sour taste if preferred. Pressure cook the split gram dAl and keep aside. Cut onion, green chilli and tomato and sauté in oil with cumin seeds well for 5 minutes. Add water. After the onion is cooked add the precooked split gram dAl, turmeric powder, gram maSAlA powder, salt and sugar. Allow boiling for 5 minutes. Remove from fire and serve hot. This should be not very thick or very thin. 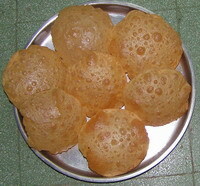 Goes well with pUri, chapatti and paRAtta. 1. If you wish you can add a little (¼ tsp) lemon juice for taste. 2. You can replace the split gram dAl by green gram dAl (Mung) or masur dAl. 3. Bengalis use Bengal gram dAl where they cook it after soaking it for 1 hour and add with pAnch pUraN, sugar, salt, green chilli and turmeric powder. Top it with bay leaves. This can be a little gravy type. 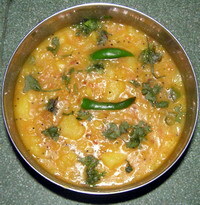 This entry was posted on May 6, 2011 at 11:11 pm and is filed under PUri & Alu Dum with tags aniseed, bay leaf, Bengal gram dal, Black gram, chapatti, chopped coriander leaves, cumin seeds, garam masala powder, garlic, ginger, green chilly, lemon juice, mustard seeds, onion, panch puran, paratta, potato, puri, refined oil, salt, split gram dal, sugar, tomato, turmeric powder. You can follow any responses to this entry through the RSS 2.0 feed. Both comments and pings are currently closed.